After sailing along the tranquil coastline of Barbados, we lay anchor on the beautiful west coast to snorkel at the reefs and wrecks as well as a visit to the sea turtles, where you get the unforgettable experience of swimming and feeding these gentle creatures. A sumptuous buffet and tropical drinks are served onboard. The rum punch is a "must" to celebrate your day as you sail off into the horizon. Indeed, their rum punch IS a must! We had an equally great time with Heather and Emil as we had with Mark and Christy two years earlier. We had the same tour guide and the same captain. Both are awesome! It's difficult to believe that someone can get paid to do what they do for a living. If I had grown up on the water, I might have moved to the Caribbean and taken such a job. Anyway, we were in the water shortly after 10am for our first snorkel - a shipwreck. The visibility was probably about 30 feet and it was cool to watch the scuba divers and to free dive the shallow wreck. After about 20-30 minutes of snorkeling, we got back on the cat and headed to our next destination. We had an hour to enjoy some rum punch and some fantastic bread made by the captain's mother. Around 11:45am, we anchored near a beach and had lunch. This was where we snorkeled with the sea turtles. It was pretty cool. This may have been where I got yelled at for "chasing" a turtle. Oops. Yeah, I'm that photographer. :-) We were probably in about 20 feet for water at this stop versus about 40 at the previous stop. So I was able to explore the sea floor a little better here. During one of my free dives, I happened upon a beautiful speckled eel. I must have caught him by surprise because you don't usually get a good look at the entire thing. Anyway, around 1:45pm we began our trip back to the pier. Of course there was plenty of rum punch served and by the time we got back I was dancing to Vanilla Ice. Anyone who knows me knows that it takes a special combination of relaxation and inebriation for something like that to happen. It truly was a spectacular time. By 4pm we cleaned up and rejoined Heather and Emil for the Galley Tour. It had been arranged just for the Cruise Critic group and began in the Olympic Restaurant with a complementary glass of champagne. We got to see salad preparation in progress, as well as fruit carving and bread basket weaving (literally baskets made of bread). The tour concluded with a treat of chocolate covered strawberries. We felt like VIPs. Back at the room, we watched sail away, had happy hour, and cleaned up a little more for dinner. An idea occurred to me for the evening Cruise Critic Cabin/Pub Crawl and I set out our scuba gear on the bed as if it were a couple of divers. We were a few minutes late to dinner but it was worth it. We were voted Best Decorated Stateroom during the awards ceremony later that night. I'm still kicking myself for not taking my camera since one of the other participants had the penthouse suite. It was amazing and came with private butler service. I think I might have been in heaven if I were one of their two kids. 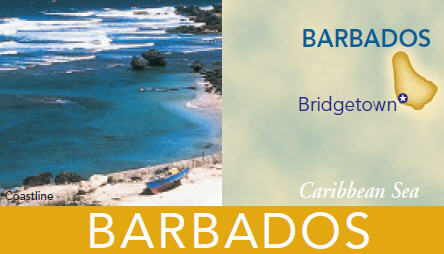 For details and pictures from our previous trip to Barbados, see our 2008 site. Although we booked directly with Shasa Catamaran, they had overbooked and actually hooked us up with Supercats. We had an amazing time in spite of my nasty sunburn from passing out on the trampoline - too much rum punch on the way back to the dock. Check out the fantastic pics.